This tuesday was the “day of the beast”, and we decided to finally eat our own dogfood and deploy OpenPsa 2 into production. This brought some nice benefits immediately, including seeing one’s own invoicing rate on the front page and much better calendar and scheduling. However, as expected it also brought some annoyances we would’ve overlooked if we didn’t use the system every day for real business. First one of these was the calendar. 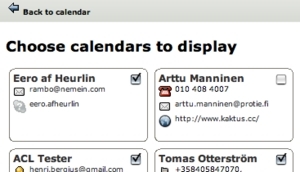 OpenPsa 2 has a nice automated buddy list for adding project contacts to user’s address book, and we had been using the same mechanism for populating calendar views. However, when you have many projects and customers, the buddy list tends to get quite long swamping the calendar. Expect to see many such improvements soon as we encounter things to improve in our use of the software. 14 December 2004. 1 minute read.